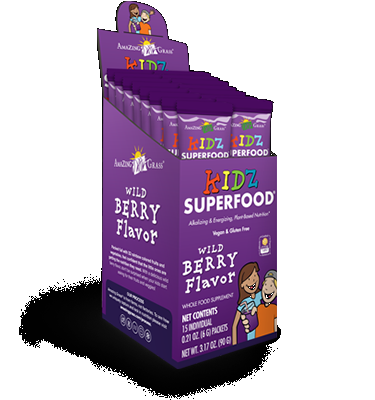 Kidz SuperFood has added a new hero in the fight against free radicals, the Yumberry. 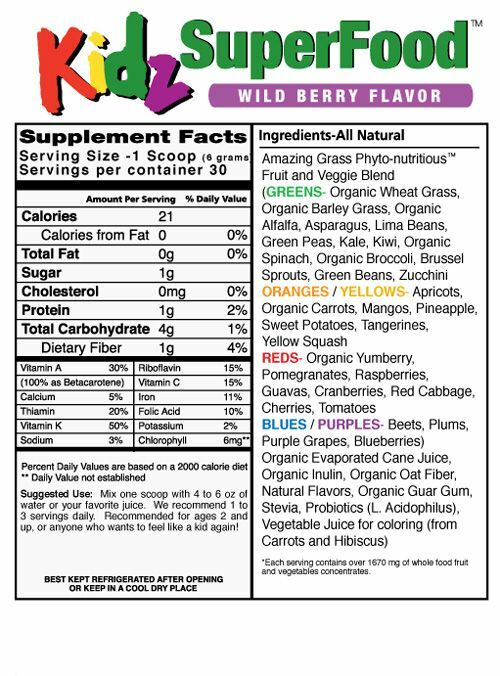 A nutritional powerhouse which combines 32 rainbow colored fruits and vegetables in a delicious berry drink powder. Mix with water or your favorite juice or smoothie. One serving gives you the antioxidant equivalent of 3 servings of fruits and vegetables. 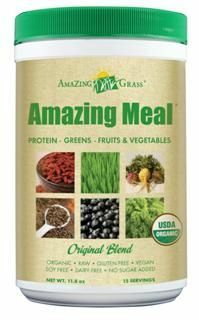 Just one 6 gram serving has the antioxidant equivalent to 3 servings of fruits and vegetables. 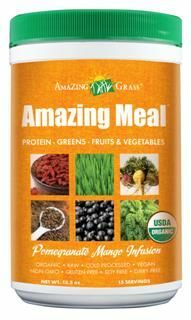 Amazing Grass Kidz SuperFood phyto-nutritous fruit and vegetable blend: organic wheat grass, organic barley grass, organic alfalfa, asparagus, lima beans, green peas, kale, kiwi, organic spinach, organic broccoli, brussel sprouts, green beans, zuichini, apricots, organic carrots, mangos, pineapple, sweet potatoes, tangerines, yellow squash, organic yumberry, pomegranates, raspberries, guavas, cranberries, red cabbage, cherries, tomatoes, beets, plums, purple grapes, blueberries, organic evaporated cane juice, organic inulin, organic oat fiber, natural flavors, organic guar gum, stevia, probiotics (L. Acidophilus) and vegetable juice for coloring (from carrots and hibiscus). Serving size: one scoop, 6 grams. Recommend 1-3 servings daily, for ages 2+. Distributed or manufactured from Amazing Grass. See more Amazing Grass products. Question: Where i can buy barley here in vancouver? A: I am not aware of where you can purchase this supplement locally in Vancouver, however you can purchase this supplement online directly from Seacoast.com. Question: can 12yold girl take as malty vitamin ,she is healthy with no problems. 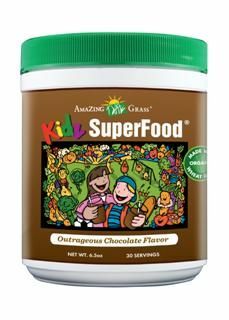 A: Yes, this powder can provide your child with 3 servings of whole fruits and vegetables in one serving and is suited for kids 2 and up. Best of all it tastes great and is non-GMO, vegan, and certified organic. 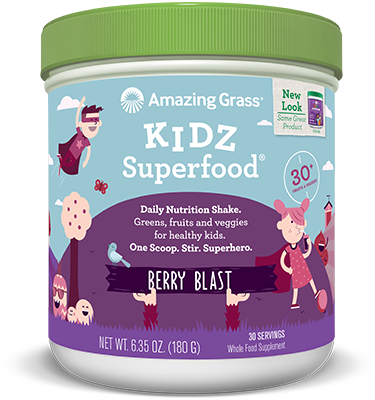 A: Kidz SuperFood is a nutritional combo which combines fruits and vegetables in a delicious berry drink powder. 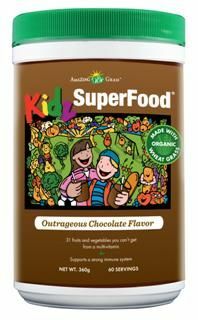 Contains over 70% certified organic ingredients and is all natural without artificial colors, flavors, fillers or other unnecessary ingredients. If you have any concerns on how this product may effect your daughter, please consult with your physician.